Mforo, Tanzania a village near Moshi, Tanzania. Solar Sister entrepreneur Fatma Mziray checking on her cows in the evening. 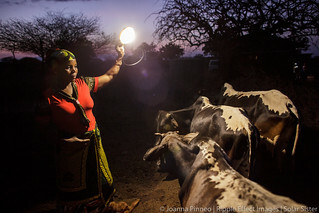 Before she had the portable solar lantern she and her husband were getting up throughout the night to check on the cows because, despite the thorny brush that serves as a fence around the cows hyenas were getting in and killing cows. They discovered that when they hung a lamp up on the tree near the cows the hyenas stayed away. This has been a great solution and they no longer have to get up several times through the night. Fatma Mziray is a Solar Sister entrepreneur who sells both clean cookstoves and solar lanterns. Fatma heard about the cookstoves from a Solar Sister development associate and decided to try one out. The smoke from cooking on her traditional wood stove using firewood was causing her to have a lot of heath problems, her lungs congested her eyes stinging and her doctor told her that she had to stop cooking that way. Some days she felt so bad she couldn't go in to cook. Fatma said, “Cooking for a family, preparing breakfast, lunch and dinner I used to gather a large load of wood every day to use. Now with the new cook stove the same load of wood can last up to three weeks of cooking. “With the extra time I can develop my business. I also have more time for the family. I can monitor my children’s studies. All of this makes for a happier family and a better relationship with my husband. Since using the clean cookstove no one has been sick or gone to the hospital due to flu.” Fatma sees herself helping her community because she no longer sees the people that she has sold cookstoves have red eyes, coughing or sick like they used to be. She has been able to help with the school fees for her children, purchase items for the home and a cow.